This month in the year of teaching teens life skills is all automobiles! Perfect timing since I have an appointment with our insurance provider about adding our 16-year-old to the policy. As soon as we find her a car she will officially be on the road. 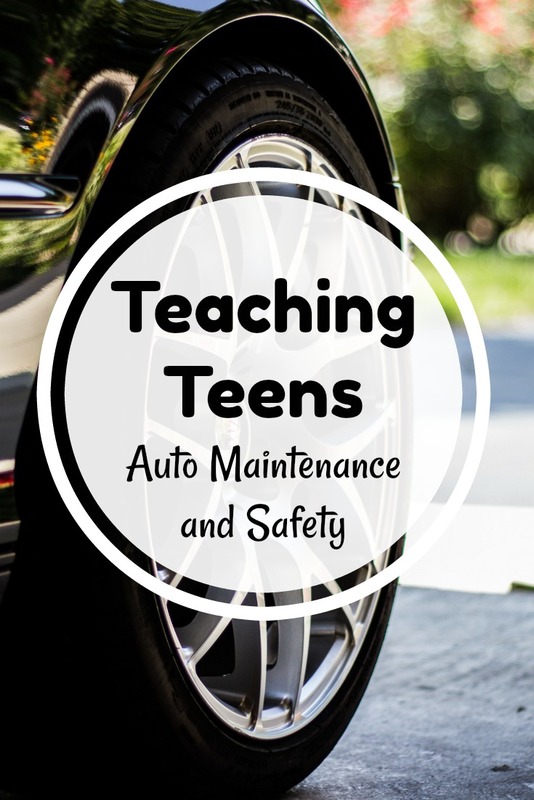 Join me in teaching teens auto maintenance and safety for the next four weeks, from airing up and changing tires, to checking oil, and staying safe on the road when they are alone. Show your teen how to air up and change a tire. Teach them how to check tire tread and pressure. 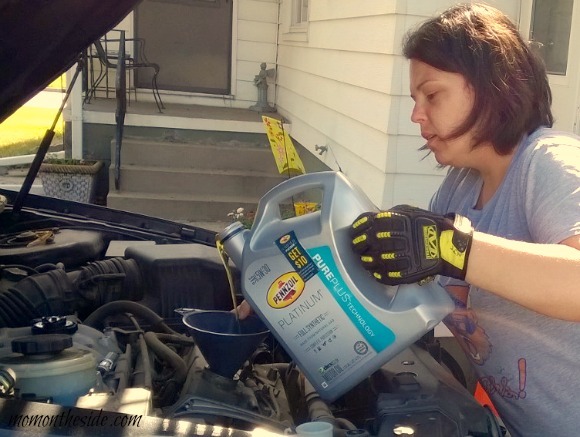 Teach your teen how to check oil and change oil. Almost three years ago my husband taught me how to change the oil in our van and it was honestly a great feeling doing it. I’m glad I’ll be showing my kids before they are 30! Check out our DIY Oil Change Kit and put one together for teaching your child! Show them how to check and fill different fluids like windshield washing fluid and antifreeze. Talk about the different types of gasoline and how to pump it. Get them involved in hand washing the car and/or show them how a car wash works. Vacuum and clean up the inside dashboard and windows. Talk about what to keep in the car in case of an emergency. Jumper cables, tire iron, spare tire, blanket, flashlight, etc. Discuss how to stay safe on the road when they are alone. Not pulling over or stopping for strangers, parking in well-lit areas at night, and what to do if they get a flat tire. Remind your teen how important it is to not use their phone when they are behind the wheel. Stay tuned for June and Teaching Teens Basic First Aid Skills!